← How to fix iPhone 4S and iPhone 4 battery issue? When you pick a video, Big Photo will launch video player to play the video, if the video is stored in iCloud, it will first download this video, so you will see a spinner for waiting. Once the video is playing, you can pause or fast scroll at your favorite frames, tap select. Then you will be given around 10 frames to choose from. Tap the one you like, or tap the Done button. This picture will be extracted and display on home screen, you can edit or just save it. Pick a picture and generate a set of icons to email it or air drop to your mac with Xcode. Crop with locking custom aspect ratio assist. Optimized for with 4” retina display! Support big pictures and large images. If you find the app behaves very oddly, delete it and reinstall. Things will be OK. It is because AppStore downloads and installs incorrectly. Small chance, does happen. Big Photo allows you to view pictures of ANY sizes at full resolution with unlimited zoom in/out and highest quality. Precisely crop with exact coordinates and pixel sizes, with or without locking custom aspect ratio. Accurately enlarge (like digital zoom) or downsize pictures with exact pixel sizes with or without locking aspect ratio. Automatically save your cropped, enlarged or downsized pictures back to your Camera Roll. Capable of big pictures and large images: iPhone 4S/iPad 2 – 74MP+ for unlimited detail zooming. 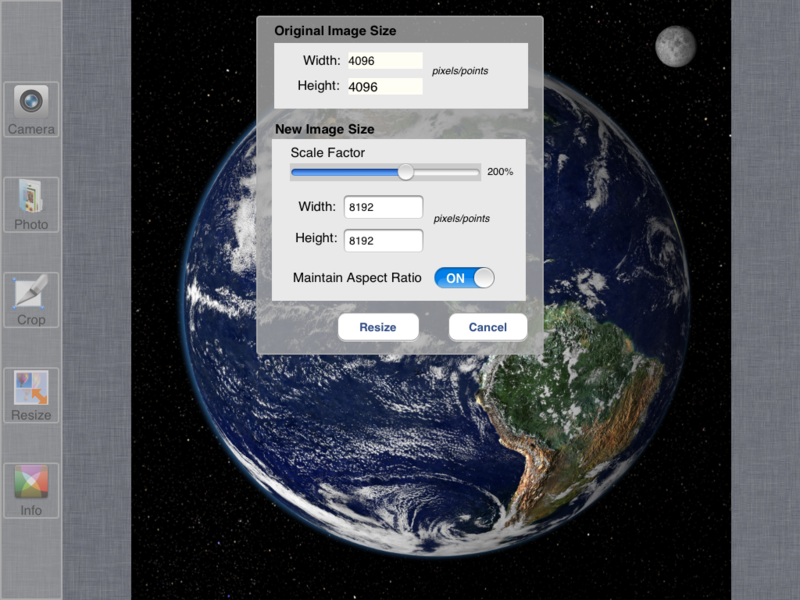 56MP+ for resize and crop – sum up the sizes of source and result images. For other devices, adjust the sizes accordingly. Work as your device’s universal image tool: for images in your emails or other apps, “Open in…” Big Photo to get detailed zoom and edit. Support Import and Export image files through iTunes File Sharing. Big Photo’s combination of features extends the capabilities of other great photo apps given its special algorithm to deal with big pictures or large images. It is also an essential tool for iPhone 4/4S/5 not only because of its wonderful zoom viewer, but also you can use crop and enlarge to achieve better results than you use iPhone camera’s real time digital zoom. ✔ PRECISION WITH EXACT COORDINATES AND PIXEL SIZES. In addition to access your Camera and existing Photo Library, Big Photo also provides document interaction support so you can launch Big Photo to handle pictures or images from within your other apps that support document interaction. Better yet, for advanced users, you can transfer your pictures between your PC/Mac and Big Photo’s iTunes File Sharing folder. For instructions how to use iTunes File Sharing, see http://support.apple.com/kb/HT4094. Support file formats:png, jpg (jpeg), gif, tif (tiff), bmp, ico, cur, xbm. In “Menu Mode” – i.e. when the menu bar is showing, swipe up/down/left/right, Photo Selection Bar will pull down or fade out. 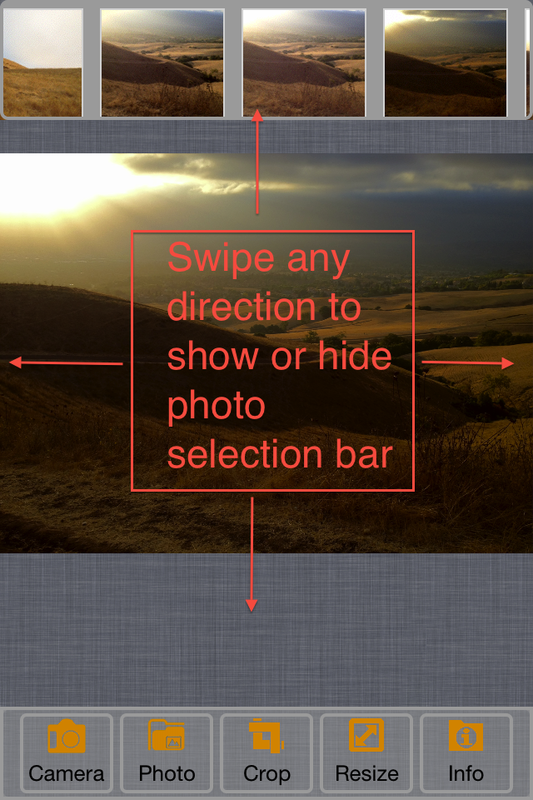 This Photo Selection Bar is a horizontal scroller to show your Camera Roll or any currently selected photo album. You swipe left or right to scroll through your Camera Roll or any photo album. Tap on any photo icon to select for viewing or editing. Tap on Camera Icon, Camera will open for you to take a shot. Pinch in/out to zoom in and out. Press and Hold on spot, you will zoom right into the spot with full resolution and 100% zoom. Double tap on the picture, you will zoom right into the spot with full resolution and 100% zoom, or the picture will zoom out to a complete view fit on the screen. Pan left, right, up, down to shift the view port of the picture. When you have pictures or images over 20 megapixels, most photo apps will work on the downsized versions of those assets. Big Photo will allow you to gradually examine those assets in its original resolutions, up to pixel level. Big Photo allows you to crop your big pictures in its original resolutions so your cropped pictures will keep much more pixels than you can get by cropping the downsized versions of the big pictures. With Big Photo, you can enlarge or scale down your original or cropped pictures to any sizes you like to. The enlarged or downsized pictures will be saved to Camera Roll automatically. This entry was posted in iPad, iPhone, iPhone 4, iPhone 4S, iPod Touch, Mobile, Photo, Photo/Image and tagged Big Picture, Big pictures, Huge image, iPad, Photo App, very large image. Bookmark the permalink. Can I save, in my photo album, my new enlarged crop image in Big Photo? It will save cropped or resized (enlarged) image to your camera roll automatically. Of course, it will do it automatically saving to camera roll. I want to look at the photo on the full screen and zoom in full screen. i have … which does this. i also need a way to organize the files – which picflick does not do – which is why i bought your app. If I cannot do this, it defeats my purpose for buying the app. Can I do this (zoom in full screen and organize pictures in the order i want) or get a refund? i dislike the process of having to buy the app to find out if it does what you want. Big Photo does not lose pixels or resolutions. Big Photo has some very unique features like “Press and hold, tap to zoom in the spot”, “Unlimited photo pixel size”, “Precise Crop”, “Precise Resize”. By precise, we mean that you can specify coordinates and size points. 1. Full screen mode will come in next update. 2. Organize photos: current Big Photo can save pictures back to Camera Roll automatically. You may organize from there anyway you want. If you want Apple to refund your $0.99, it is fine. But, be aware that Big Photo has everything it claims to have. I am not very good in computing, like your app, but do not knew how to e-mail it or send to camera roll. When you click Crop or Resize, you will see “Crop and Save image …” or “Resize and Save Image…”. Then you click “Open”, select “Camera Roll”, you will see a new image is added to your Camera Roll. Nice,fast and very beautiful, thanks! How to import a 40mp pic into my iPad? It seems to me, that every import resizes the pics to 14mp. Nevertheless, your app is a great help for my ‘big’ files. now you can do whatever you want, including save to Camera Roll. An essential app that makes you see the difference! The two pictures are great examples. what is trashbutton? I tip on photos, ok? then tip on photolibrary, ok? now tip on camera roll, ok? on the top, left, there is the button back to photos, in the middle the name of the tab – camera roll – under this there are all taken photos and films, but there is no more button. where can I find the trashbutton, but what have I to do, that trashbutton comes? The new zoom feature is excellent and a big improvement but if you zoom in too quickly on a 36 MP photo then the view jumps to the bottom right of the image. in the center of screen. Most effective view of picture with big size is double tap on the spot you want to focus. Big Photo will try to show the spot in center of screen with full details. With Big Photo, you will find iPhone 4S camera roll picture is much bigger than its version in photo streams. In a future version might we see some controllable aspect ration 4:3, 3:2, 8:6, 6:8, 2:3, 3:4, etc? This will make it easier to crop “standard” photos out of the app. Big Photo 2.0 (waiting for review as of 10/10/2012) will come with “lock custom aspect ratio” assist. This will make it easier to customize crop size. I use your app a lot on my iPhone 4S, iOS6. I just noticed something that raises a question. Lets say your app says my picture is 2.98 MB, why does all other source of info (exifwizard, iPhoto, OS finder) say it is only 866 Ko? The photo info is based on the processed working file from your original image. It is substantially bigger because of using highest quality compression. I was wondering the same thing and read this comment. I need my photos to be less than 1 MB. Which file size is accurate? The file size within Big Photo or the file size from other sources? If you are using iOS 6, the file size of Big Photo info is the same as the size in photo library. For some old versions iOS, Big Photo may use temporary file, so it may display the file size of the working file. This is fixed in later Big Photo updates. I cannot find camera roll any more. If I open big photo, there is on left side: camera, photo, crop, resize and info. There I click on photo, then comes a window: Over all it says: Access Photo with blue background, below Photo library, Import Photo, Export Photo, Earth by NASA. If I click here on Photo library, a window comes and says: This app does not have access to your photos or videos. You can enable access in Privacy Settings. But I don´t know how to do. Where can I find ´privacy settings´? Please, would you help me? Tap “Big Photo” to “ON”. Ok, but this is my problem! Where can I find “Settings” app? Is it on PC i-tunes – big photo app? but there I also cannot find Settings. On my i-Pad app big photo there is also no Settings. Or do you mean i-Pad, there on screen settings, there apps on left side, and here seeking the app big photo? But here I can find all the apps for example: WLAN, Bluetooth, Messages, iCloud, Mail, iTunes&app Stores, Musik, Videos, Fotos & Kamera, iBooks… and so on, but there is no app big photo. I don´t understand where I can find the Settings you mean, being big photo inside. Thank you for helping again. Please check email and let us know how you resolve your problem. Hi. Love your app, but looks like if I take a photo in portrait orientation using the regular camera, then resize it using Buig Photo, the resulting saved image from Big Photo is set to Landscape mode. Any way you can look into this and fix the problem? Thanks for reporting this version 2.1 specific problem. Fixed in version 2.2. 1. You can view your photos with full resolution. i.e. see every pixel in your original photos regardless sizes: 5mp (iPad/iphone4), 8mp(iphone4s/5), 28mp(panoroma)… . If you use iOS default photo library viewer, you can only view the downsized version which is not more than 4.75MP. With photos you take either by iPhone camera or Big Photo camera, you can view more details with Big Photo than default iOS photo library viewer. The BIGGER the photo, the MORE details you can see with Big Photo. 2. You can bump the megapixel (enlarge)! After bumping the megapixel, you can check its size by tap “Info”=>”Photo Info”. Then, you print it out. Depending on your printer DPI, if your original photo is 4×6, then the bumped up photo could be 8×12 or even bigger. Many customers like Big Photo app because the quality of enlarged photo is still very good. I use your app for work. I was wondering if it was possible to resize all photos in camera at once instead of resizing one at a time? We will consider this idea in future releases. Can you explain more on how you expect Big Photo to resize photos in batch mode? When you go into you photos to select the picture, maybe add a select all feature with an option to choose the size you want the pictures to be resized to. Can Big Photo use images of maps I store in Dropbox folders? Currently Dropbox for iOS does not support “Document Interaction”, so you are not able to use “Open By Big Photo” function yet (I hope they can do it soon). For now, you can tap “Save to Photo Library”, and Big Photo can handle it from there. On my iPad and iPhone, I use DropText (a product of the Dropbox team, I think). When I click on big pictures, I get the usual results of zooming only so far. I’m thinking that is because the iPad viewer is limited. However when viewing such an image I then can open it in about 15 different apps on my iPad including BigPhoto and “save to camera roll”. The big map opens just fine directly on BP and zooms to quality equal to my Mac. Try this on you iDevices and verify it. If it is as I say, I suggest putting this quick tip near the top of your forums. I saw a number of questions on how to do this on other sites. Could help sell you product. Thank you for the speedy rely. Thank you so much for suggestions. We are highly encouraged by responses from customers like you. We will appreciate that you may put a review/rating on iTunes AppStore. It appears that when resizing an image, Big Photo strips most of the EXIF data from the original file. Would it be possible to have a setting that would preserve all the EXIF data in the fille? We will look into this in the future. Thanks for feedback! The new update that includes batch processing is a welcome addition, and I understand the logic of sorting all like-sized images together so as to make batch resizing consistent, but I am at a loss to figure out how the “groups” are sorted? I have over 2000 images on my Camera Roll and even if I know the existing size of the images I want to resize, it is very diffficult to find the group of images with that dimension. If the groups were sorted by dimension at leastit would help. I’m not sure I have a solution, but I thought I would mention it. My work-around is to create an album first and put the group of images into it, then it is easy to find the group. Thank you so much for feedback. In current update, all photos in selected source photo album will be grouped according to their dimensions/size, then sort by number of photos of the group in descending order. We will think about other possible selectors in future release. Regarding your suggestion on selecting photos of different dimensions to process in a single batch, we may support that in future release. The current release is totally for simplicity of UI. 1) Just increasing the number of pixels? 2) How does this affect the pic resolution? 1. Picture pixels will increase. If you want to increase print dpi, that means you want the printer to print the picture in smaller size. To print out smaller size, you can use Big Photo to downsize the picture without changing DPI. How do I get the app in batch resize mode. Will rate after this is explained. If you are running on iOS 6.0+, then you will see “Batch Resizer” menu item when tap “Photo” button. Tap on “Batch Resizer”, you will begin the process. One other issue I have with BP. The way to get high resolution zoom anywhere: select a photo, once it finished loading, “double tap” ON the spot you want a clear view, BP will zoom right into that spot with full resolution. Then use “pinch” to adjust zoom level. Try to play with “double tap” gesture, in addition to “pinch” and “pan”. Please tell us if this helps. Double tap works fine unless I want to double tap on Houston, TX and follow a railroad line to Llano,TX. Pan and refocus would be much better. GoogleEarth does that. I agree, this is the biggest problem with Big Photo. If you double-tap, it only shows that one tile in high resolution, but if you scroll, everything else is blurry. It should load the tiles in high-res as you scroll. There is another app out there that does this perfectly. I’d like to rank Big Photo higher in my online review, but this problem keeps the rating lower, and I end up using that other app instead even though the overall features are better in Big Photo.. Thanks folks. 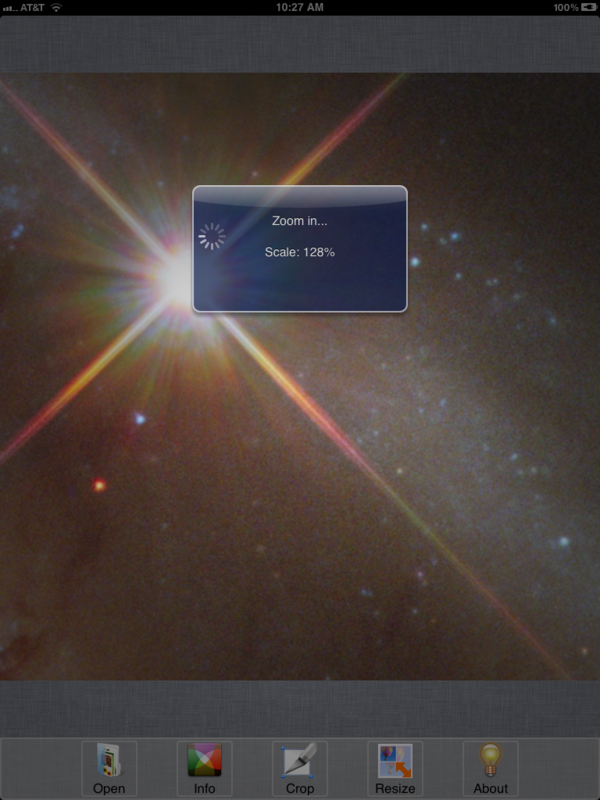 We will update Big Photo’s zoom viewer so that no double-tap refocus is needed in high resolution mode. Even pdf files refocus after a picture move. 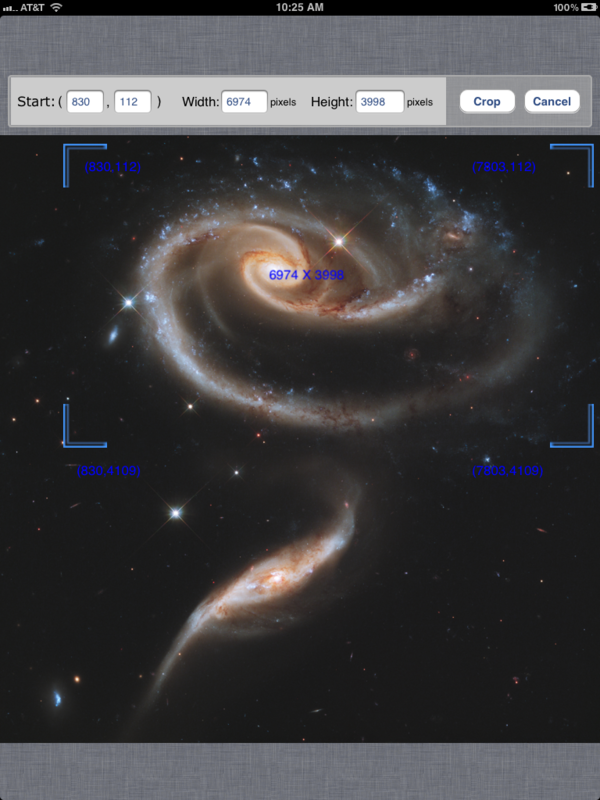 We just add a seamless zoom viewer for you with current version 3.3. Please write a review on AppStore to let us know how do you think. Thanks. Thank you so much for making the seamless zoom viewer! It’s working great. I’m going to leave a 5 star review right now. Among the many attributes of Big Photo, one I love is that photos that I view in BP display all the information about that photo in ‘i’, or the information panel. As I try many photo apps, I can’t remember what app I used to take a picture. Big Photo tells me, along with a bunch of other photo information [is that what EXIF means?]. This helps identify how camera and photo editing apps behave [app name, size, clarity, etc] as I delete the inferior cheesy apps. When I offload my devices [iPad, iPhone] to my Mac, I sure would love the same ‘read’ capability, and even some of the editing too, since device apps are simpler – I’ll never figure out Photoshop LOL. Also because I’m not so good at this resizing thing [I tried in Photoshop and failed miserably], I wonder if you could fit ‘FB cover’ and ‘Flickr cover’ in the displayed description of the resize choices. For dummies like me, this would be a selling point in your description: Create Facebook covers, Flickr covers, Instasize photos easily with Big Photo”. Thanks for suggestions. Will appreciate if you may also drop a review/rating of Big Photo on iTunes AppStore. New to this app, I have encountered several problems. I need some help. I am unable to load TIF image file if it is in the portrait orientation. The image does not show on the screen but the image in four are all available. TIF file in landscape mode seems to work fine. the frame anchors can all still move freely as if there is no aspect ratio fixed at all. When working on TIF files, when I execute either a rotation or flipping, the app will quit. Lastly, most of the files I am using this app on are TIF files, in addition to making this app more compatible with TIF files, it will be very nice that TIF files be offered as an option on saving as well. Or, at least the file to be saved after resizing will remain as the same original file type. Since TIFF is not native to iOS, TIFF support in Big Photo is limited to Zoom, Info, Resize, Crop. It will be saved as JPG format. If has Alpha channel, then it will be saved to PNG if this option is turned on. Can you consider taking App Setting out of “Info” button. In order to actually look at file info, users have to do an extra tap. Can you separate app setting out since most users, at least I, may configure setting only one time but I do look at file metadata a lot more often. Thank you. Thanks for feedback. Are you using Big Photo on iPhone or iPad? Both iPad1 on iOS5 and iPod touch 5 on iOS7. I really appreciate the app’s capabilities, as there is nothin gels comparable in a single app in the AppStore. I do have some suggestions about the cropping function. Once the crop dimensions in pixels is set, the user should be able to move the crop box around by sliding, not having to enter obscure starting pixel points. I waste a lot of time trying to position the fixed aspect ratio crop box I need. Also I can’t seem to understand the “loc” and aspect ratio function. It doesn’t seem to do anything, the crop box’s “corners can still be moved in any aspect ratio when the switch is in the locked position. Thanks for suggestions. We will do whatever we can for this issue for next update. Hi there! I just downloaded this app and have a basic question. I take my pictures with a high resolution setting in my DSLR camera. From there, I upload them to my iPad to edit. I was trying to use Big Photo to resize the images to a higher resolution to email to my customers for printing but when I save the resized images to my camera roll for emailing, they seem to downsize back to the smaller resolution. Am I missing something? Thanks so much! The email app will limit the size of file. It may scale it down if too big. Thanks for the quick reply. Is there a way to email the resized image directly from Big Photo? Or do you know any other way to do that on an iPad without it being downsized? Appreciate the help! You can check if flickr.com is good for you. It supports full resolution pictures and 1Tb free storage. Is there a way to edit a photo and then scroll directly to the next on the roll or library without having to go back to library? Great app and well done. Is it possible to set up a batch convert on images so that I Cut the top 10% off each image but leave the rest. Or can I crop the bottom 10% only and leave the rest and do this in a batch convert? From what I can see the batch converts are proportional only ? The batch resize does not have to be proportional. You may experiment with any custom size. However, the image may be distorted to fit in that size. The idea of combining crop with resize in batch mode like you mentioned, we have explored that. Because only a few customers need that, also complicated for average customers, so these options are not in the batch resizer. I wanted to download the app. But I realized that it requires iOS 7.1 [ I have an iPad mini2 Retina with iOS 7.06 means that I cannot download it? ] is true? 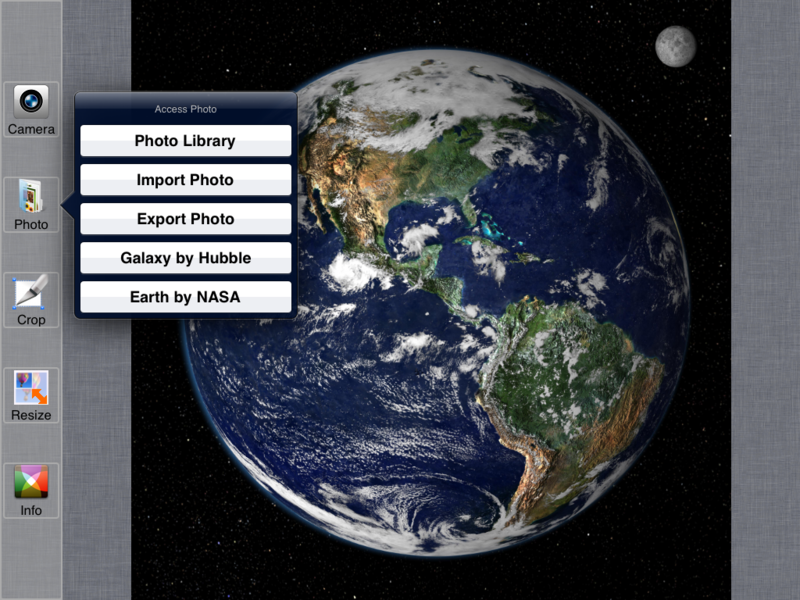 Yes, Big Photo 4.0 only supports iOS 7.1 and above. Idea for a new feature. Please add a feature to “square up” a rectangular image by adding borders to the edges so that the image retains its original resolution (of the long side). Photoshop allows you to do this with the crop tool by reverse cropping and extending the crop box outside the original image. All the apps out there that do that (usually designed for posting to Instagram) downsample the hi-red image to some ridiculously low resolution. Sounds a like good idea. But does anyone need this? Anyone who posts to Instagram could benefit since Instagram forces a square crop, thus losing part of your rectangular image. There are a lot of apps available to do this, but almost all downsample the image in the process to some ridiculously low social-media resolution. I don’t post to Instagram, but do have a bunch of photo editing apps the force a square crop when loading an image, again forcing me to crop away part of my image. So squaring up the image first, at full resolution would allow me to load the entire image into the other apps for processing without losing any of my image. I could then crop away the extra space later. Great feedback! When square UP the image, do you think the two padding rectangles should be transparent or have solid color (e.g. white or black)? Probably solid color will be less confusing for average users? Hi BigPhoto people. I really love this app, it’s really useful. I have a need to make the white in an image to be transparent. I see that in “settings” it give you the option of saving the alpha… How do you specify what you want to be the Alpha? “Save Alpha” On ==> meaning you want that PNG file and rotated image to keep their transparent portion when resize/crop/rotate. Please note this option will consume more memory/storage. We are verifying and work on a fix. Thanks for patience. You may air drop to your Mac, or use iPhoto/Photos app from your Mac where your iPhone/iPad is connected to the Mac. With the recent update to iOS 9 Bigphoto still works good but when my iPad is in landscape orientation the menu/keyboard remain in portrait orientation. Can this be fixed a sap please. Fabulous, what a blog it is! This weblog provides helpful facts to us, keep it up. I want to use Big Photo to change dpi from 72 to 300 for printing. When I try to do this the size of the file in megabytes reduces dramatically from say 2mb to 800kb. How can I maintain full resolution as I am merely rearranging the pixels not deleting or adding them. Thanks. You do not need to change file size or resolution, just change its DPI when you are in Resize menu. I will not give it full score because the two tap zoom only goes to 100%. Ideally it should be possible to set the magnification rate in % in a preset function so that the magnification was able to match my magnification glass. The other thing missing in the app, is the ability to preset where on the screen the double tap zoom window should show up. As it is now, the zoom window almost cover the part of the photo I am zooming in on. I want to be able to see both the zoomed in part of the photo, and the original part of the photo at the same time. Another missing feature is the ability to preset the size of the zoom window in %. With those features added, I would have paid 500 usd. for the app. I use the app to look at photos while painting and drawing. Thanks Petter! This sounds like a very interesting use case. We will consider adding this feature for future release. I have 6,200 pictures on my iPad running the latest OS and using the latest Big Photo and my pictures when I select Photos->Camera Roll are no longer sorted correctly by date. There are pictures a few years old interspersed with pics I took today. I looked at the meta data and the dates are accurate but the sort is not working correctly. Thank you! Hi Tim, this issue is due to iPhone sync your photos from iCloud, so it is possible many old photos are created after some newer photos. We will see if we can sort by original taken time if these information available.